Growing up in an affluent suburb of New York City, sixteen-year-old Nevaeh Levitz never thought much about her biracial roots. When her Black mom and Jewish dad split up, she relocates to her mom's family home in Harlem and is forced to confront her identity for the first time. Nevaeh wants to get to know her extended family, but one of her cousins can't stand that Nevaeh, who inadvertently passes as white, is too privileged, pampered, and selfish to relate to the injustices they face on a daily basis as African Americans. In the midst of attempting to blend their families, Nevaeh's dad decides that she should have a belated bat mitzvah instead of a sweet sixteen, which guarantees social humiliation at her posh private school. Even with the push and pull of her two cultures, Nevaeh does what she's always done when life gets complicated: she stays silent. It's only when Nevaeh stumbles upon a secret from her mom's past, finds herself falling in love, and sees firsthand the prejudice her family faces that she begins to realize she has a voice. And she has choices. Will she continue to let circumstances dictate her path? Or will she find power in herself and decide once and for all who and where she is meant to be? Natasha Díaz is a freelance writer and producer. As a screenwriter, Natasha has been a quarterfinalist in the Austin Film Festival and a finalist for both the NALIP Diverse Women in Media Fellowship and the Sundance Episodic Story Lab. Her personal essays have been published in the Establishment and the Huffington Post. 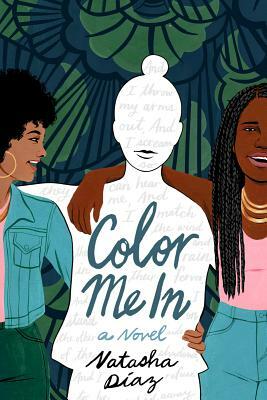 Color Me In is her debut young adult novel. Originally from New York City, Natasha now lives in Oakland, California.